It is a day to be feared by most sports coaches, especially those at the head of NFL franchises, as “Black Monday” has arrived, and owners take a good look at how they have performed throughout the season; or seasons. It is normal now to expect a head coach to get fired from a team that has not been able to get into the playoffs, even more so if they haven’t reached that point in several years. 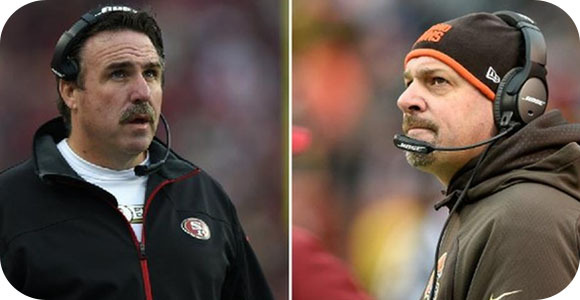 The 49ers have a 5-11 record in the one year Tomsula has been head coach, after being praised to be a strong playoff team, they will have to watch the games from home. The problems didn’t start when he stepped in, but rather long before. When CEO Jed York forced Jim Harbaugh out, he left with offensive coordinator Greg Roman, and defensive coordinator Vic Fangio. These three had led the 49ers to three playoff berths and a Super Bowl appearance between 2011—2013. Getting rid of them was the first mistake. On top of this, the team saw a high number of retiring players including, Patrick Willis, Chris Borland, Justin Smith and Anthony Davis. They did not use QB Colin Kaepernick to his full potential, instead of strengthening him as a pocket QB, they tried to turn him into a mobile one. Injuries did not help either, Carlos Hyde, Anquan Boldin, Antoine Bethea, and Vernon Davis. All of this combined led to a horrible start for the 49ers, which Tomsula just couldn’t get out of. Pettine has a 10-22 record over two seasons, with a 3-13 for this year, and Farmer was promoted to GM before his tenure. Nothing seemed to go right for the Browns, as their only three victories this season were against Titans, Ravens and 49ers; all of whom had horrible seasons themselves. The main reason for this, the inability to get the defense on point. Despite the fact that Pettine was a defensive coordinator for 5 years, he was unable to get the defense working. They even drafted DT Danny Shelton, signed CB Tramon Williams, and other high-profile free agents, but it was no use. The Johnny Manziel issue did not help either, especially with his inability to control it. As Josh McCown got injured, it gave Manziel the chance to start, but with all the on and off-field scandals it wasn’t looking good.